2 rice cooker recipes that go beyond rice dishes. 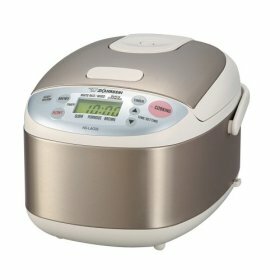 Does it seem like a waste to buy a rice cooker just to cook rice? To the Chinese, the answer is an obvious NO because rice is served at the dinner table nearly every day so it is important to have an appliance that cook rice easily and quickly. This doesn't mean that they won't use the rice cooker to make other dishes. My grandmother used to cook another dish by steaming it on top of rice that is nearly done in the rice cooker. Some people only have a rice cooker in their kitchens. For example, students who live in dormitories that do not come with a kitchen or stovetop. Unless they eat out all the time, there will be times when they need to cook something (other than rice) with the rice cooker. Here are some interesting chinese rice cooker recipes that do not feature rice. The literal translation of this dish is Tea Leaves Eggs. The rice cooker is the ideal cooking pot to make these eggs. The Chinese drink a lot of tea and to throw away all those brewed tea leaves seems such a waste. So, they add these used leaves to a pot, add some fragrant spices and cook some eggs in it. We all know that hard boiled eggs are fairly bland. Adding them to the tea and spice brew create a nice colour and fragrance to the eggs. The interesting thing about these eggs are the marbling pattern and the fragrance of the spices. To achieve a more pronounced marbling pattern, crack the egg shells by knocking them gently all around before adding to the spice brew. Here's a video of how Diana from appetiteforchina.com make these eggs. Homemade yoghurt kits can be quite expensive and there isn't really any need to buy yoghurt starters. Use your rice cooker to keep the milk warm enough to turn into yoghurt. A slow cooker or thermal cooker can do the trick too. If you have a fuzzy logic rice cooker like the Zojirushi Micom Rice Cooker & Warmer (Model No. NS-TGC10/18), you can try making this black sesame cake or this whole wheat sponge cake. Here's another 21 surprising things you can make in a rice cooker. The rice cooker can be found in almost all Chinese kitchens. There are a variety of rice cookers in the market right now. Some are simple no-frill with just cook and keep warm options, some have additional accessories such as a steaming tray. Others have small computer chips to help with the cooking. There is also a microwave rice cooker. Let's talk a bit about a couple of these. By far, the most common rice cooker is the electric one. It is made up of a cooking chamber with a heating element at the bottom and a power cord. A removable metal bowl sits snugly in the cooking chamber on top of the heating element. The rice is cooked inside this metal bowl. The cover may or may not have a glass panel to let you check on the rice. These rice cookers usually only have the off, cook and warm buttons. You can cook rice and congee in it. It can also be used as a steamer. I remember with much fondness my paternal grandmother steaming a bowl of egg custard or fresh fish in it...right on top of the rice cooking inside. This is how she did it. Rice takes about 20-30 minutes to cook while an egg custard or fish only needs 5-10 minutes. She would start cooking the rice first. When the rice is about done, she places the other dish on top of the rice to cook. Talk about saving energy (^_^). As technology advances, so did this kitchen appliance. The fuzzy logic rice cooker uses the microchip technology. It can cook a larger range of food. There are pre-set timing for different food including risotto and rice congee. There are also quick cook and slow cook functions. I can cook rice in a simple electric cooker, but a fuzzy logic one is on my wishlist. I am dreaming of all the yummy stuff I can cook with it. Some brands even state that it can make breads. My top brands would be Zojirushi and Panasonic. Yes, all Japanese brands because they are simply better.